Legacy's Rockin Robin, has finally arrived in Australia. Niedleich Miniature Schnauzers,will be eternally grateful to Patty and Mack Ledgerwood of Washington, for giving us the opportunity of "adopting" this stunning dog, to love and show his potential in our country. 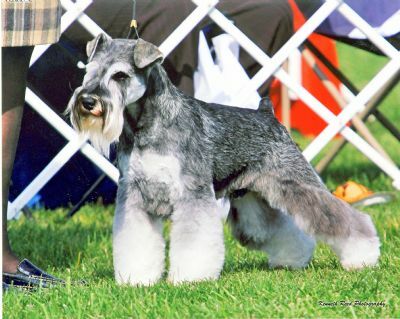 Robbie gained his title in the U.S, with four majors, including a Best in Speciality show at Portland. His wins also include Best in Sweeps and a best bred by Exhibitor (Group 2) all with 'natural ears'. UPDATE. AS OF THE 16/01/2104. ROBBIE has been given a CLEAR EYE CERTIFICATE from Dr. Anu O'Reilly of Animal Eye Care. Robbie also has a clear certificate for Myotonia Congenita. Robbie is a joy to live with, and his show attitude is to die for. 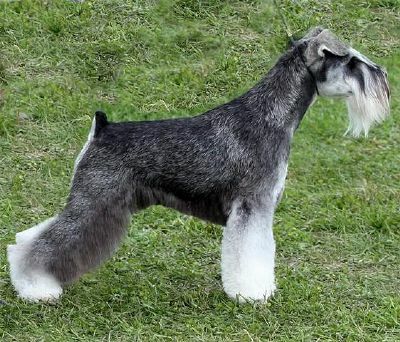 Robbies progeny is in the ring in the US, with his son Legacy's Rock Around the Clock (Rocky)gaining his American title, whilst just out of Puppy class. Rocky is also a BISS winner. LATEST NEWS. ROBBIE has just gained his AUSTRALIAN TITLE, seven weeks out of quarantine,taking Breed in 10 of l3 shows. including a Runner up in Group, Intermediate in Show, and other classes in Group. 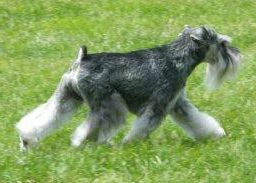 Robbie on the 5th September 2010, won BEST IN SHOW, at the Schnauzer Club of South Australia Speciality show, under breed specialist Mrs. M. Kidd.(SA). NOW BEST IN SHOW (ALL BREEDS)under Mrs. S. Rickard and Miss B Watt, at Numurkah 20th Oct.2010.